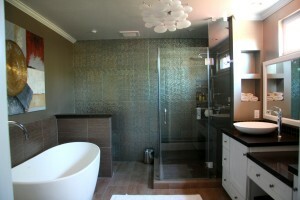 Bathrooms are among the most private spaces in any house. Given this personal character, remodeling projects invite extra scrutiny and use your creativity. 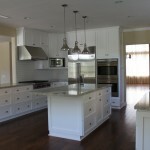 Long hours may be invested in the selection of paint, tile, sinks, faucets, vanities, mirrors, and accessories. These are personal decisions, to be sure. But there are common goals for every project, no matter the budget, style, or location. We’ll show you how to make the process a little easier. The ideal bathroom serves as a refuge — it’s no place for fussiness. Scale down the variables to establish a soothing atmosphere. Contrast dark woods and finishes with light ones for instant drama. A neutral palette with one strong color will create the same effect. And if the bath is small, you can repeat simple design details, such as matching floor and wall tiles, to make the space appear larger. “It is important to use the same materials and features throughout to unify the design scheme,” says Miami designer Wendy St. Laurent. If a bath feels cramped, it may be necessary to strip the space down to the studs and reconfigure the room. “The biggest mistake people make when starting a remodeling project is to get bogged down with filling a new space with too many useless things,” says Birmingham architect Bill Ingram. 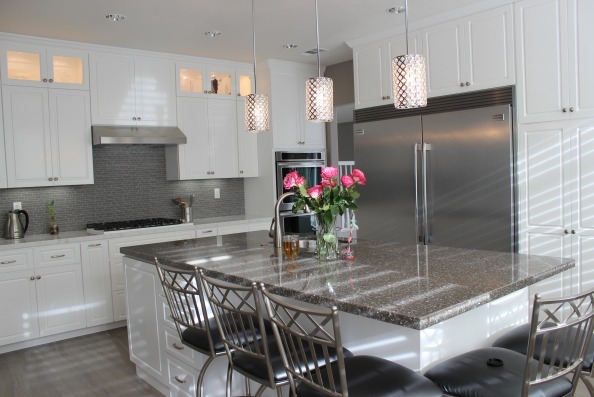 Less-permanent elements, such as fixtures, interior walls, and cabinetry, are candidates for refinement. But plumbing stacks and drains are not so easily modified. Take a critical look at the layout, weigh the options, and plan accordingly. If the house has decorative wainscoting, arched doorways, beaded-board paneling, or similar points of style, consider echoing those features. An updated bath should not appear to be an island of architecture or design — modernist touches will look out of place in a cottage, for example. The goal is a renovation that harmonizes with the existing structure. The space doesn’t have to feel clinical or prefabricated. “I don’t like the bathroom to look just like a bathroom. It is a room after all, and the elements in it can take on the feeling of furniture,” Ingram says. 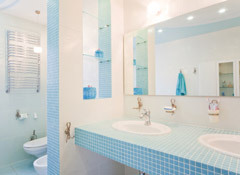 Avoid trendy colors and design fads when selecting tiles, faucets, and fixtures. Classic elements, such as subway tiles, vintage-type nickel fixtures, and claw-footed tubs often make better investments. 4 common kitchen remodeling mistakes. ” The general contractor is employed by the client, on the advice of the architect or the architectural technologist. A general contractor must first assess the project-specific documents (referred to as tender documents). She contacted us via email, telling us that she wants to convert the existing back patio to a garage. 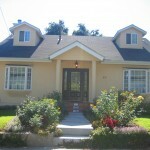 The house where we will do the conversion is in Los Angeles. 1. Dig for new footing foundation for the third missing wall and for the front of the garage. The front of the future garage will have a 16′ garage door so there will be no footing where the garage door is but from each side of it. 2. We will demo the pave’s floor and we will pour new concrete slab which we will do it during the pouring of the footing, if city inspector will allow us to pour it at the same time. 3. After that being done, we will build the missing walls, stucco the new walls, run new electrical for the new garage, installing the new garage and call the final inspection. There will be inspections prior to the final one such as framing, electrical, stucco paper, drywall nailing and final so make se that our contractor knows what he is doing. Try not to waste time on unnecessary corrections. Before any work begin, you will need to have plans and submitted to the city for approval so your new garage will be legal because if it os not then it does not exist and you can lose value. If you choose, you can add a nice 36” door with glass to bring light to it or paint the concrete floor to make it more personal and even insulate and drywall the walls to create a nice studio. we decided to keep the open beam ceiling. 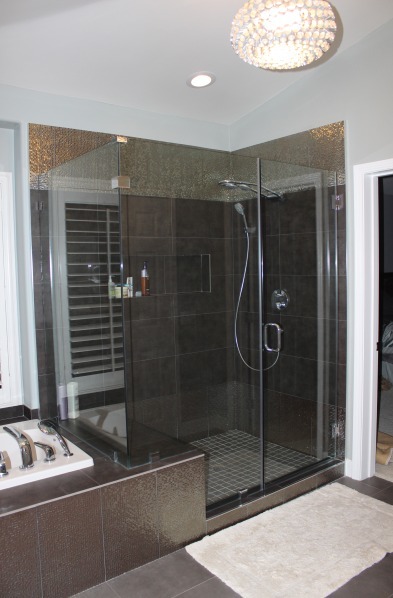 Custom shower with dark Porcelain tile on the walls, frameless shower door, build in nitch and big shower head. 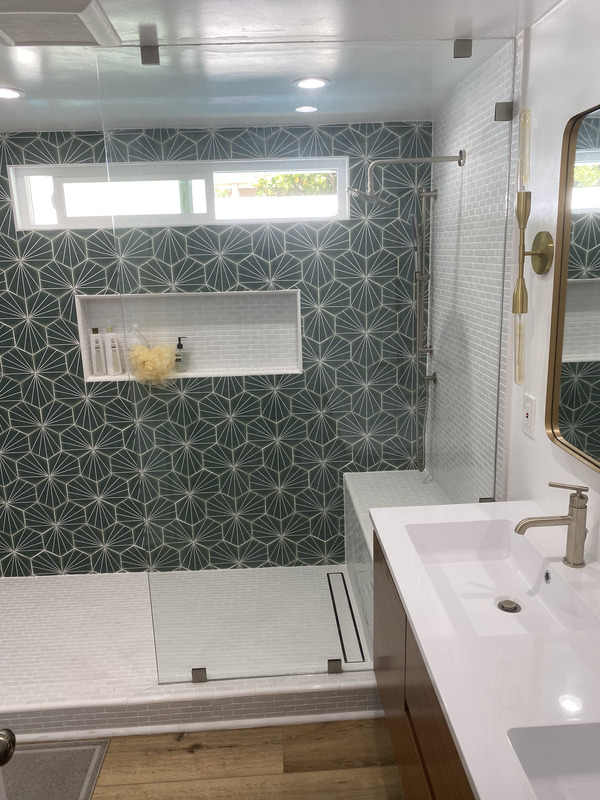 I know that shower is part of the bathroom but I wanted to focus on this aspect because it is, in most bathroom such as mine, a big and main part of the shower process. What is the size of your old shower? Do you want to enlarge it? If yes, is there a way to remove a wall to make the shower bigger? Or maybe you want a steam shower, a bench? So many things for one shower but as one that take only shower then the bigger the better, if possible and if not then no worries, we can still create a shower that you will enjoy it all along. The interior of your new shower is important. The tile or Mosaic on the walls, the build in notch for the soap, the floor and place of the bench. Are you looking to have one or two shower heads, one on each side? Well, there is no such thing as the perfect shower. One shower can be perfect to one but not to the other so it is important that you will know what do you love to have in your new shower? What are your priorities? Look around you If you are not sure what is it that you are looking for, its ok. Take a look at magazines or click here for photos and ideas. 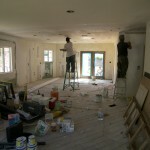 Work with your contractor, ask him questions and trust him to deliver the results that you are looking for. We wish you good luck in the process and hope that the information here will help you. The kitchen is definitely the heart of the house – playing host to family meals, casual conversations with friends and family, a quiet morning for a good coffee, art studio for the kids, you name it. 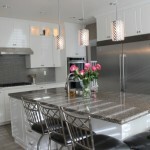 In recent years and with the economic shift, many people have downsized and smaller kitchen areas are now a way of life. But it does not have to stop you remodeling your kitchen since there are many design ideas that we can create for small size kitchen. 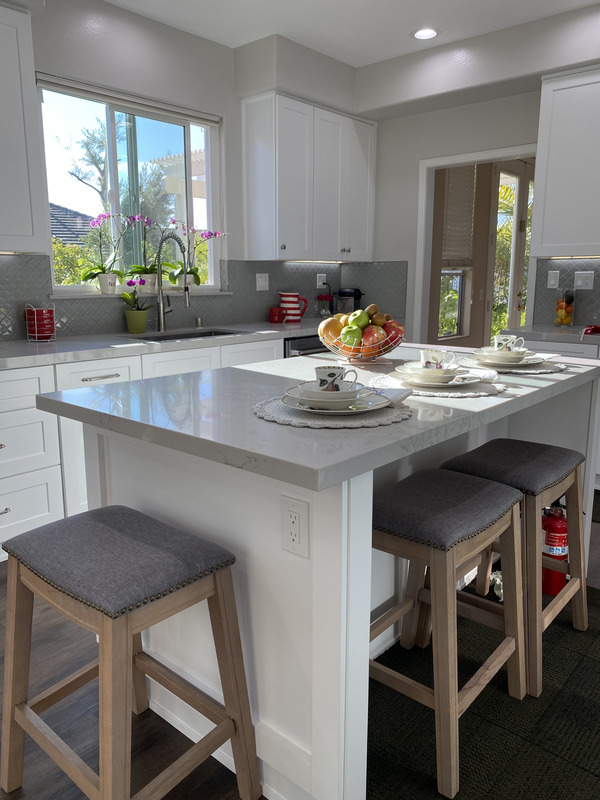 In our industry, yes the construction in Los Angeles, there can be surprises during the remodeling of your home which some of them can be challenging. The surprises are the one that were hidden in the first inspection, behind walls, under the floor etc. We are going to remove two walls that in between of them there is a wood fire-place that it place make no sense at all, but this is for another time. After the removal of the drywall from the two walls that we need to demolish, we had to make sure which one is the load bearing wall so we opened part of the ceiling, as close as possible to the connection of the ceiling and the wall, to see if the wall/s support any ceiling joist or kickers (beams that come down from the roof and lay on the wall). 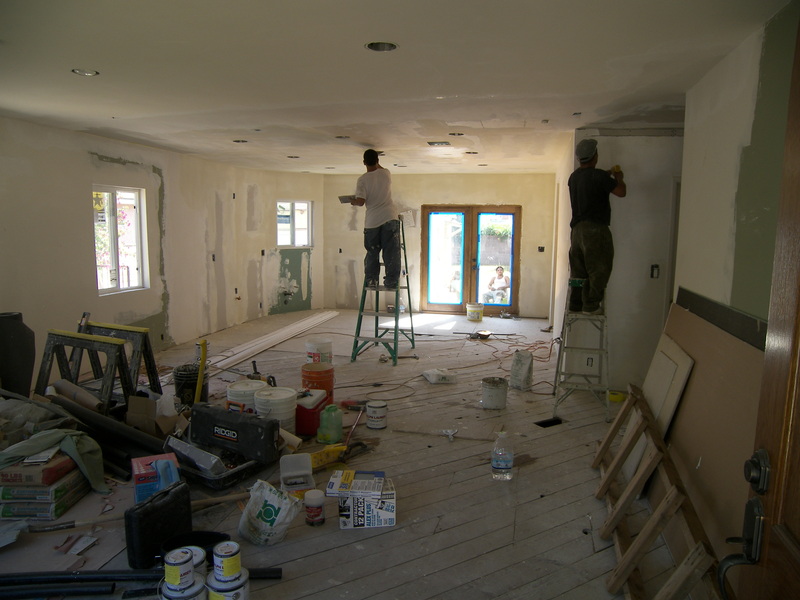 You want to know exactly which wall is a load bearing wall, how to remove it, what material to use and to be safe and knowledgeable doing that kind of work. 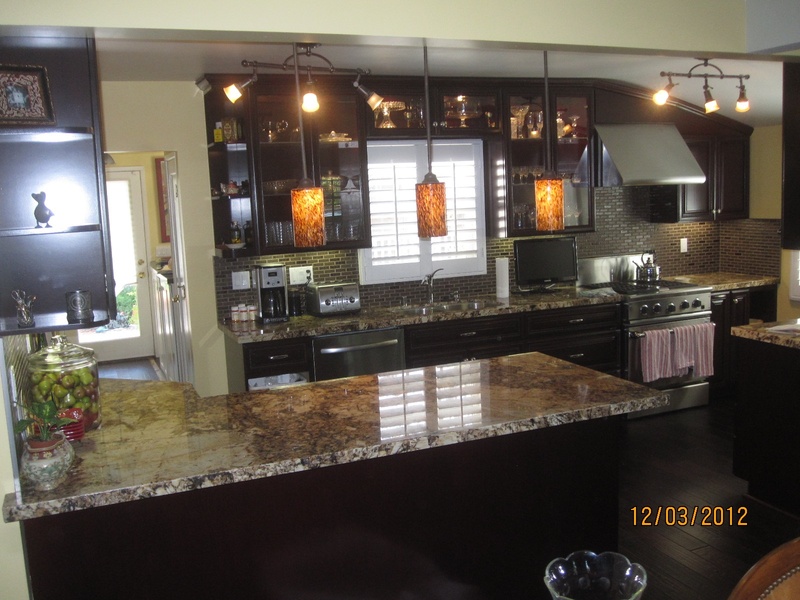 The best is to hire a license general contractor in Los Angeles that will know, hopefully how to deal with that. Inspect which wall is a load bearing wall, get a license contractor, engineer details and ask questions even if you think it may sound stupid. It is your house. 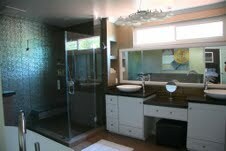 Modern master bathroom with custom shower, frameless shower door, white, two level vanity with two sinks, recess lighting and big white frame mirror. is it for your new house? is it for an existing house but the first time you want to remodel a bathroom? The first thing that we do is meeting you at your house and asking you a lot of questions about your taste, look, colors and style. 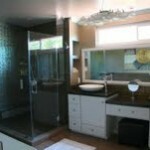 We want that the new bathroom remodeling will be part of the entire house with its design and style. 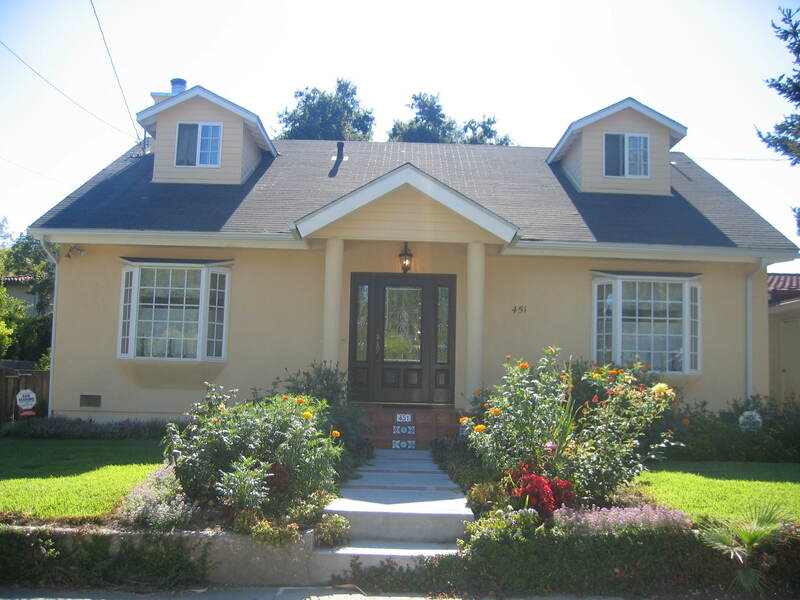 We want and will update it, remodel it but we will tie it with your house. 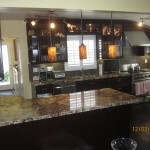 So you are thinking to remodel your kitchen in Los Angeles. You are looking to change the old design, the doors that don’t close properly no more. You also want to show off, why not, right?? 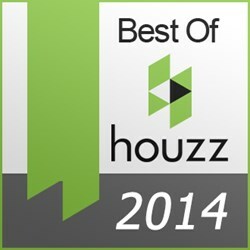 When it come to home remodeling in Los Angeles, the competition is wow!!! There are so many contractors out there that i get overwhelmed by that my self so i can only imagine what you, the home owner is going through. So you decided to go for it, “taking the chance” and make the call to a general contractor in Los angels. I do not know what other contractors will tell you and the promises they will make. I do know that for you it will be confusing. After all, we all ask you to invest your money, your saving in someone who you don’t really know. I understand that. 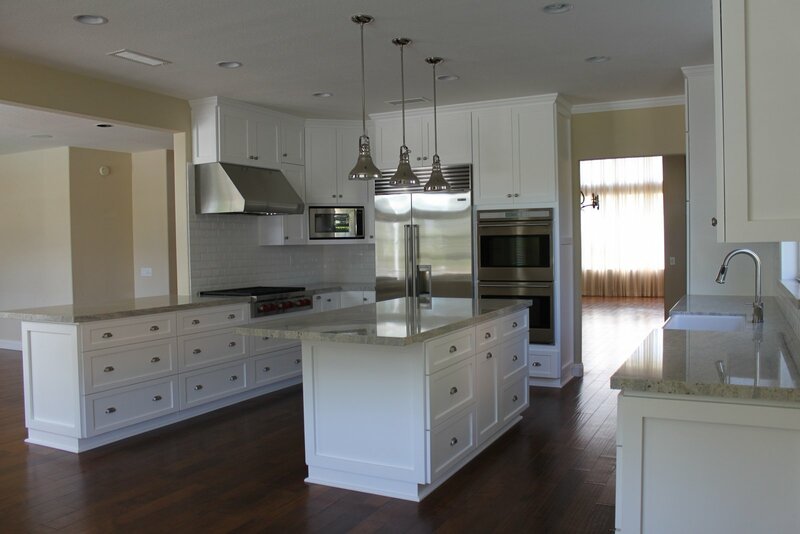 The design of your kitchen is most important because once you choose the design and the cabinets are made, there is no way back unless you pay extra for changes SO do not rush, ask your contractor tons of questions. Do not ask to many people what they think, to many opinions will only confuse you so forget about it. Ask your self what are your and your family needs. What will make your life easy. Moving the sink to another place? What about the appliances? Same place or new one? I know, it is confusing and that is why we at Noah Construction & Design will make that process easy as possible for you by making things clear and simple, after all we are not Nasa here…. 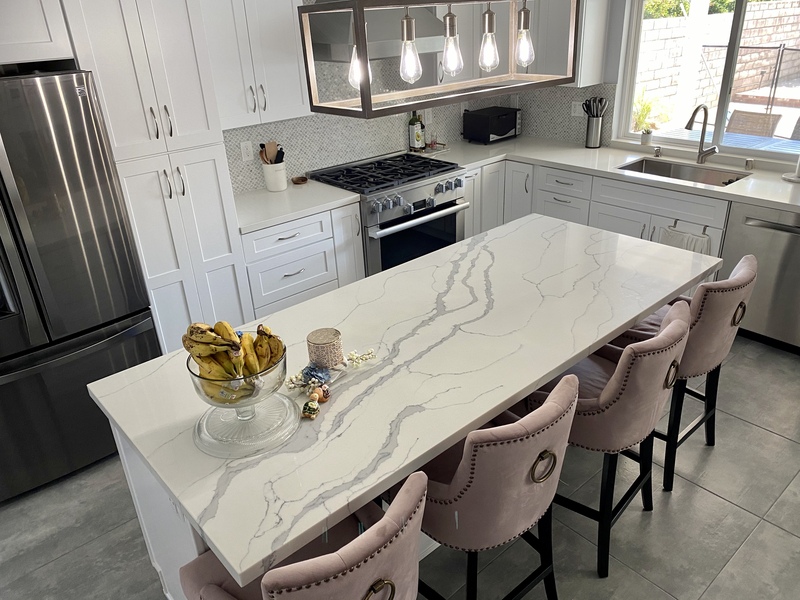 After you will choose the design, color and style of the cabinets, you will start a journey that is fun and most exciting and when your kitchen remodeling is complete, call your friends for dinner, show off, it’s ok. Sometimes we work hard for those moments. We deserve it! !